A preference for applicants for Chief Constable of the PSNI to have served outside Northern Ireland has been dropped from the list of desirable criteria in the selection process. A senior occupational psychologist will “dip sample” notes taken by selection panel members and ask them to justify the marks they allocate to shortlisted candidates for the chief constable’s job. A preference for applicants to have served outside Northern Ireland has also been dropped from the list of desirable criteria in the selection process. 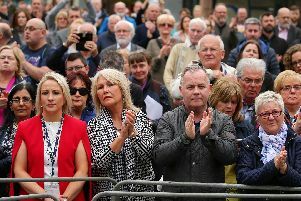 The steps are among several beefed-up scrutiny measures introduced following controversial comments by Sinn Fein leader Mary Lou McDonald on who should succeed the retiring George Hamilton. Mrs McDonald was accused of undermining the integrity of the recruitment exercise when she said she did not have confidence in any prospective candidate from within the PSNI. Her remarks in February prompted calls for the customary Sinn Fein representative to be excluded from the selection panel assembled by the PSNI’s oversight body, the NI Policing Board. Those calls were ultimately resisted, with board members instead agreeing to introduce new quality assurance measures to safeguard the process. Details of the steps have emerged as the recruitment exercise for the £207,500-a-year job went live today. Policing Board chairwoman Anne Connolly said: “This position carries significant leadership, operational and representative responsibilities and the board is looking for an exceptional leader with an ability to drive and deliver organisational change to meet existing and future challenges. “As a board we want our policing service to be representative of the community it serves. We welcome applications from all chief officers who believe they possess the range of skills, abilities and capabilities for this key post. It is understood all eight members of the selection panel – three independent board members and five political members, including Sinn Fein Assembly member Linda Dillon – have signed confidentiality agreements to prevent them publicly discussing the process while it is ongoing. They will also undergo two days’ worth of extra training and perform dummy interviews with senior officers before the formal interviews at the end of May. English recruitment consultancy Pertemps Professional Development, a company that specialises in the criminal justice sector, has been hired to design and deliver the process. This is a break from tradition – the NI Civil Service recruitment arm, HR Connect, would have performed this task in past competitions. A Pertemps occupational psychologist will sit in on the interviews and candidate presentations and scrutinise the scores and notes of panel members at the conclusion of each. The board has also appointed equality and diversity advisers to monitor the process. As in previous trawls for the Province’s top policing job, a chief constable from another force will also sit in on the interviews to provide advice on operational matters. The job is open to any UK officer at assistant chief constable level or above who has completed the police’s strategic command course. Officers with equivalent experience in the Irish Garda are also eligible to apply. In total that would amount to around 260 eligible candidates. The Policing Board is taking steps to make them all aware of the post, with individual emails and proactive approaches to other police forces and representative bodies. The competition closes on May 7. Candidates will be shortlisted on May 14 and candidate assessments are scheduled for May 23 and 24. Experience from outside Northern Ireland was once a prerequisite for applying for the chief constable’s job. That was changed to one of the desirable criteria in 2014. Board members have decided not to apply the criterion at all in the search for Mr Hamilton’s replacement, which brings the process into line with practice elsewhere in the UK. The candidate ultimately recommended by the board will have to be signed off by Secretary of State Karen Bradley before their appointment is confirmed. Anyone interested in applying for the job can attend a familiarisation day in Northern Ireland on April 16.